I have published a working paper on the Lorenz curve being a fractal property at academia.edu. Global income has increased exponentially over the last two hundred years; while, and at the same time respective Gini coefficients have also increased: this investigation tested whether this pattern is a property of the mathematical geometry termed a fractal attractor. The Koch Snowflake fractal was selected and inverted to best model economic production and growth: all triangle area sizes in the fractal grew with iteration-time from an arbitrary size – growing the total set. Area of triangle the ‘bits’ represented wealth. Kinematic analysis – velocity and acceleration – was undertaken, and it was noted growing triangles propagate in a sinusoidal spiral. Using Lorenz curve and Gini methods, bit size distribution – for each iteration-time – was graphed. The curves produced matched the regular Lorenz curve shape and expanded out to the right with fractal growth – increasing the corresponding Gini coefficients: contradicting Kuznets cycles. The ‘gap’ between iteration triangle sizes (wealth) was found to accelerate apart, just as it is conjectured to do so in reality. It was concluded the wealth (and income) Lorenz distribution – along with acceleration properties – is an aspect of the fractal. Form and change of the Lorenz curve are inextricably linked to the growth and development of a fractal attractor; and from this – given real economic data – it can be deduced an economy – whether cultural or not – behaves as a fractal and can be explained as a fractal. Questions of the discrete and wave properties and the accelerated expansion – similar to that of trees and the conjectured growth of universe at large – of the fractal growth, were discussed. What a time, what a week, what a day – this morning I had the ‘Eureka’ of my life. For years now I’ve had my fractal model matching the evolution of the universe, but with what I discovered this morning, I now have it also matching the evolution of the elements and the periodic table. Everything fits – inextricably – through the geometry of a fractal. If you don't mind, I'm going to share, for the record, how this came about – before I get my head down writing it up. Madness! They had questions for me relating to how I get growth, and accelerating growth out of this geometry - I hadn’t included this in my methods ? I replied to them saying: the Lorenz distribution is one aspect of the fractal, and that with all its aspects together (I have discovered) the fractal demonstrates (at least for economists) production, consumption and equilibrium (and other stuff). Can I write everything up in one paper for you with all the aspects? Or? On about Tuesday I started to think fractal (again). 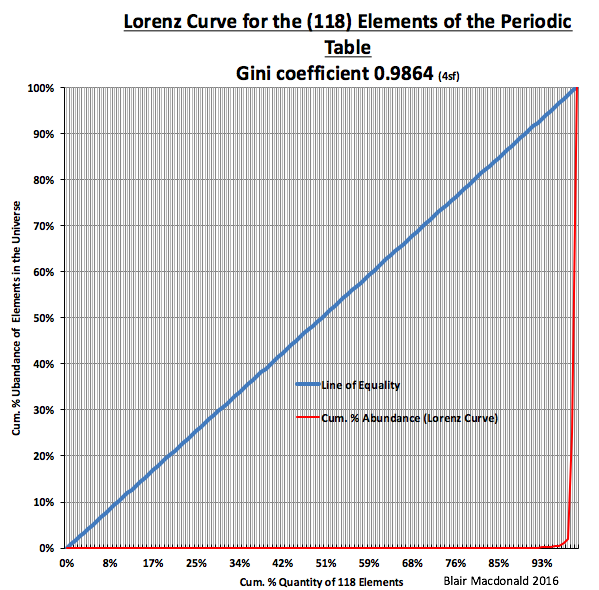 Do the elements of the universe form a Lorenz curve? If they do, this is important. I searched the numbers, and drew a conclusion in quick time. Damn! Yes they do! Of course they do! Hydrogen constitutes 75% of the elements, and Helium some 23% - the rest are small fry compared. They are the ‘one the percent’ – they hold the ‘wealth’ of the elements not dissimilar to any other system. And then I thought about the other aspects of the fractal: equilibrium, production cost… equilibrium ..cost.. equilibrium...?? and then it came to me: Iron is the equilibrium - the ‘sweet spot’! And the lighter elements before iron are out of equilibrium, and so too are the heavier unstable one’s larger than it. This all conforms to my fractal model, and so I then thought about the time involved – because the first bits ( the H and He), of a fractal are the largest and their 'wealth' accelerates with time - think of the trunk of a tree as it grows, they actually do accelerate. Again – a fit. H and He were 'created', one after the other, in the first 1 or 2 seconds of the ‘big bang’. The other small fry element (and us) came later – and the sub-atomic particles earlier. Now I’m going to try again, and get someone’s (a physicists) attention; because I really don’t want to explain this to an economist. I have been watching the documentary BBC Atom: The Key to the Cosmos for inspiration. 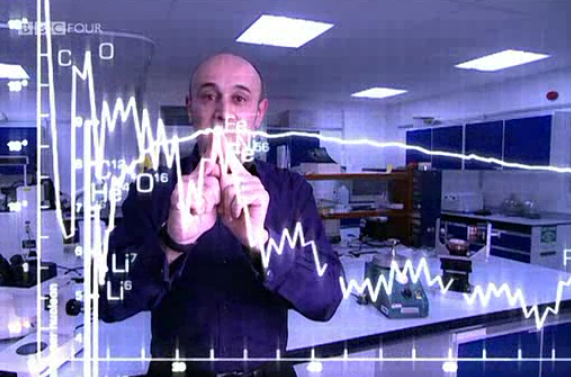 Below is an image of Jim Al-Khalili showing iron Fe the most stable and of 'modest' abundance of the elements. 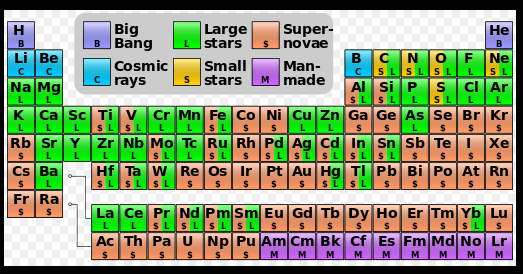 And below that the periodic table showing how and when elements were formed. The older the more abundant.